UPDATE: Congratulations, Kelly Marie! Your book has been shipped! One of my favorite things to do with Emmerich is to go for walks. 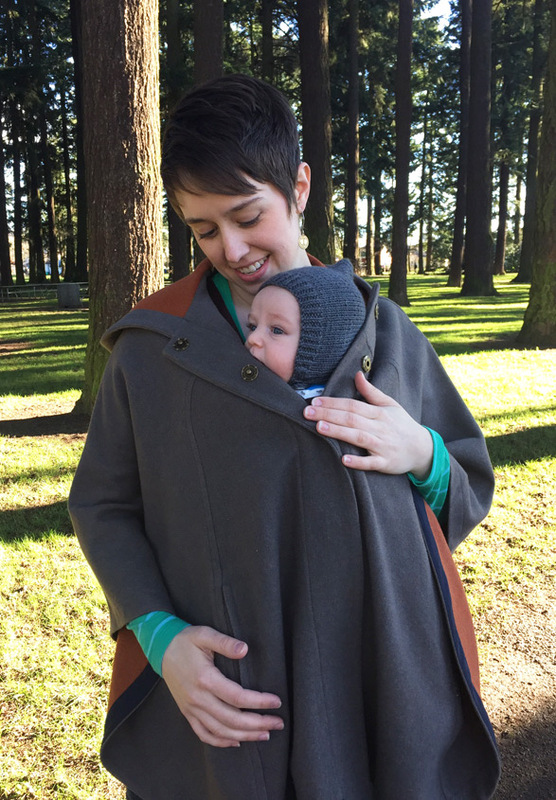 I wrap him up in a Moby and we go to the park by our house where he can look at all of the trees and slowly be lulled to sleep by the motion of my walking. I get some exercise, he gets a nap, and we both get fresh air. I don’t have to worry about him getting cold either, thanks to one of my favorite things I own, my Pendleton wool cape. No, I didn’t make this cape. I was lucky enough to go to a sale at the Pendleton headquarters in town and purchase it for a steal. 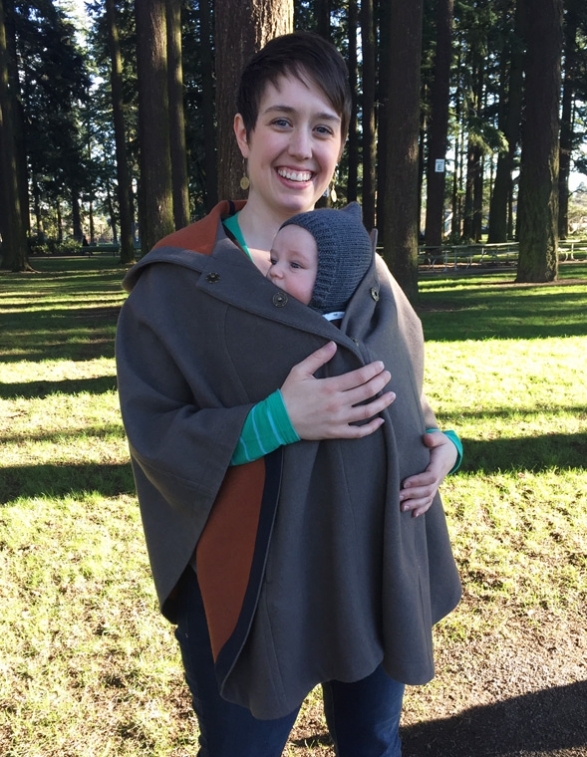 It is so fun to wear, whether or not you’re concealing a little snug baby inside! Do you ever get cold on an airplane? Get. A. Cape. I love it when I’m flying. It’s a thick wool blanket that keeps me nice and toasty! There is a lovely pattern for making a cape in the book Hand-Stitched Home by Susan Beal. Not only is there a cape, but there are quilts, pillows, an ottoman, and a project by me- plant hangers! 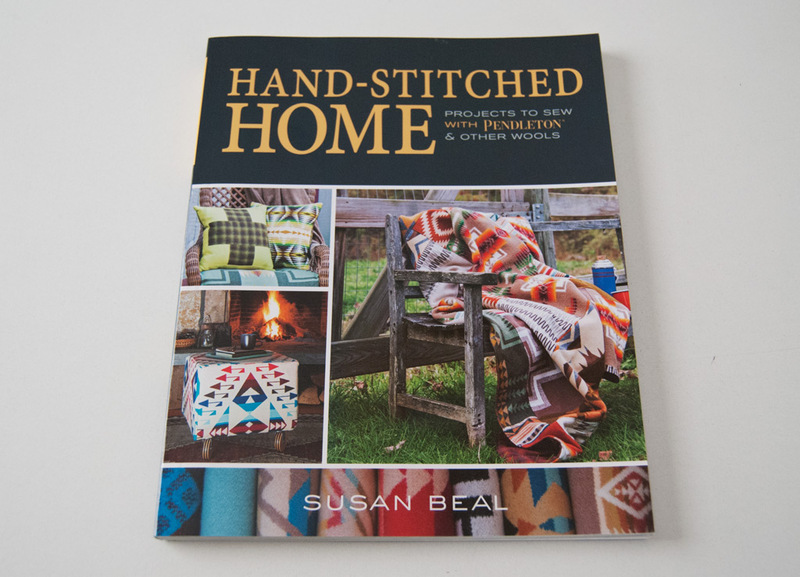 When Susan asked me about contributing a project to her book, I knew I wanted to make something completely different than what you’d usually find in a home-goods sewing book. I wanted it to be easy too, because I usually only design or make things that are complicated. How did a plant hanger pop into my head? I honestly have no idea, but they turned out to be fun and easy to make, so I was happy. This book has projects like bags, pillows, scarves, quilts, a belt, and of course that great cape I mentioned. Susan was kind and gave me an extra copy of the book, which I’d like to give to one of you! You can enter to win it by leaving me a comment with something you would like to sew out of wool, and the winner will be chosen at random. Be sure to add your comment with your correct email address where I can reach you, to let you know if you’ve won! This giveaway is open to US residents only. Comments are open until March 4th, 2015. The winner will be notified by email. UPDATE: Comments and entries are now closed. The winner has been notified (Kelly Marie) and the book has been sent! This entry was posted in Life, Projects and tagged fabric, giveaway, sewing on February 25, 2015 by Amy Alan. 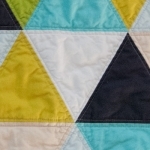 I’d like to sew a wool quilt, lightweight, with a cotton flannel backing! The thought of it reminds me of my grandmother and the quilts she used to make out of discarded wool clothing. Ahh- I’d love to make the same thing! Wool is just so cozy and fun to snuggle under. I would love to make some felted wool clogs! I have knit and felted other items but clogs really intrigue me! Interesting! I bet they’d be nice and toasty. I’d love to make a cape with matching mittens. Capes make feel like a little kid. Twirling round and round. Cute baby. I’d like to make a cape and a wool quilt with a minky backing. Sounds so warm and toasty. BTW, beautiful baby ! Wool and minky- how lovely sounding! That would certainly encourage lots of snuggling. I love your cape and can’t believe how much he’s grown already. He is precious – and you look great too Mom. I’ve never seen anything with wool, but have always wanted a wool pea coat. But after seeing the cape, I might have to consider that. It’s way more in line with my sewing ability. Hope you and your family are doing well. Also hope you’re finally getting to use that beautiful new sewing space!!! I can’t believe how much he’s grown either! He’s so long he’s wearing 12 month clothes (which makes mom cry a little, as he’s only 4 month old)! Oh a wool cape is sooo lovely and really easy to make. You’d do great at sewing one up! And yes, I have gotten in a bit of sewing time here and there. It’s called “set that baby down for a nap and RUN downstairs to sew as FAST AS YOU CAN for the next 30 precious minutes”. Ha! Ooh! A scrappy grandma quilt sounds fun. I’ve been meaning to stop by the Pendleton store. I want to make a pouf stuffed with my unusable scraps and their wooly worms. I’ve been meaning to go too! I always want to buy yardage of blanket wool, but yeesh, my pocketbook can only handle that during their yearly sale! I love the idea of anything in Pendleton wool. It’s so classic and beautiful! 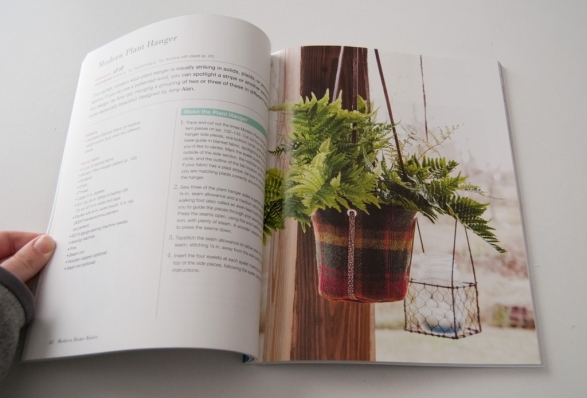 But your plant hanger–that’s awesome! Thank you! 🙂 I’m a big fan of Pendleton wool too. It’s so luxurious! I love the cape! I would like to make pillows and matching throw. We have a leather sofa and its cold sitting on it. I bet that sofa’s cold! A wool throw is just the perfect project indeed! I would love to make a cape. I made some for my granddaughters and their moms have asked for an adult one. Perfect! You could really use this book then. I hope you win! I would love to see a vest made out of different cuts of wool, sort of like a quilt with wool squares. pendleton wool is so fabulous. Interesting! Yes, Pendleton wool is amazing. I’m lucky to live not too far from the outlet store, which is tons of lovely yardage to buy. I have been dying to make a cape for agessss… this will be a great opportunity…thank you for the giveaway.! Amy, your son is precious! Such a handsome baby boy! I love Pendleton (growing up in the Willamette Valley how could I not?!!). This morning I grabbed my Pendleton Black Watch Plaid blazer to wear with my black dress, tights and boots….it’s snowing here in Northern Virginia. Again. I love the plant hangers you designed, fun and functional! I would love to have have a copy of Susan’s book ~ the cape looks amazing and would be perfect for those long flights back to the land of my heart. Thank you! I think he’s pretty darn cute! Good luck towards winning the book! It certainly sounds like you could use a good cape. Flights from one coast the other are soooo long, and having a wool blanket to wrap yourself up in on a cold airplane? HEAVENLY. Your plant hangers look neat and contemporary. Great job at rejuvenating a typical hippie-era staple! And your cape is convincing me that I should make one. Unfortunately, I’m not living in the USA, but I’ll put my hand on this book. Your pictures walking with your son are so beautiful. Much happiness! Ha- thank you! And yes, make a cape! They are so easy and so fun to wear. I’m sorry I couldn’t have the giveaway open to overseas. Shipping prices can really be expensive! Although I’m well past carrying my infant in this way, wouldn’t it be a great “non-traditional” baby shower gift?!? The book looks wonderful and would be a welcome addition in my sewing room! It would be! I had never considered it as a shower gift, but that would be aaammaaazing! Creative idea for the plant hanger. I would make a short wool jacket for my daughter who works hard and doesn’t have time to sew. I am retired, sew every day, and like to make things for my family. Thank you for this opportunity. Hi, Marion! How kind of you to sew for your family. I would love to sew every day! Good luck to you! I love Pendleton wools. I was looking on eBay at their colorful remenets to make pillows or throws to brighten up some dark brown recliners I just bought! That’s a great idea! Their colorful prints would look great against dark brown fabric. Have you ever ordered from the Woolen Mill store? 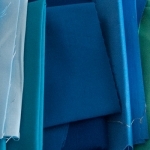 You can call them and order yardage- they are really helpful! Love your picture with your baby all snuggled up! If I had some wool, I would start on a coat for next winter. Thanks! I loooove baby snuggles! You know, I need a new coat for next winter too. That wouldn’t be a bad idea to start it this Spring so it might actually be done in time for Winter! Can’t blame you there- wool capes are amazing! Interesting idea! Would you make the sleeves leather, or keep them wool as well? Do you have a pattern picked out to use? I’d do the sleeves in wool as well, but probably a contrasting (or complementary) color. I love the idea of a wool cape! I’m in! Thanks!! Good! I want everyone to have a wool cape, so that they are always in style and I can always wear it (as if I would ever give this cape up). I’m keeping my cape forever and ever! OMG, how nice it would be to make that lovely cape. Thanks for the opportunity to win that book. Best of luck to everyone. You’re welcome! Good luck at winning! Love your pictures of you and the baby. Such a happy time of life! Thanks for the opportunity to win the book! Thank you, Mary! It is a happy (yet very trying) time. Best of luck towards winning the book! Oooh! I’ve been wanting to make a cape ever since I lost mine a couple of years ago. Your cape is much nicer than the one I had, so it would be a wonderful replacement. Oh no! I’m sorry you lost yours. Hopefully you win so that you can make a lovely wool one. They are certainly heavenly to wear. Congrats on having a pattern in the book! So cool! You can leave me out of the giveaway- I reorganized my sewing books just yesterday and oh my, the tower is likely to topple over and crush me one of these days, eek! But you and Em look so adorable… I’m telling you, you and OhhhLulu better stop it with the cute baby pics stat because you’re doing bad things to my ovaries!!! Thanks! Haha- yes, I hear you on the sewing books. I a paired down to my favorites before we moved, but… uh… that pile is still massive. And I will NOT stop with baby pictures, because I want to see a tiny Ginger baby nestled between TWO pugs! Ahh! Doug and Peggy may not approve, but too bad for them! HAHAHAHAHAHA! Hopefully the pugs wouldn’t cry when the baby did like my mom’s corgi, ack! That corgi bark is just so, so intense!! Truth: I’m a little afraid to have a kid! My mom used to always say, “I hope one day you have a kid just like you so you understand what I have to deal with!” and UM, it’s a scary thought!! I was a lethal combination of energetic and mischievous and got in SO MUCH TROUBLE. Oh gosh, yes, the corgi bark is SO LOUD and SO SHRILL. I am grateful that Emmerich isn’t even fazed by Dax’s bark though. I guess hearing it for 9 months before he was born helped a lot! Hahahaha! I was an AWFUL kid. The things I did and said in public…. well…. let’s just say they stopped taking me anywhere for a 3 year stretch. I have my fingers crossed that Em is like Rob, who was calm and liked to quietly play with Legos, unlike me, who’s favorite games included “make the biggest mud pit that I can”, “say rude things to strangers” and “stand on my chair and scream in restaurants”. Oh, I’m so screwed. Wow! That’s amazing that you have had that blanket since then, and yes, it would make an amazing cape. I love the idea of you donating the book once you’ve used it- how nice! I love it when I can help others . . . and if I hadn’t discovered paying it forward with books to my respective local library, I’m sure my home would have some serious sag to the floors! So it’s a 2-way benefit. These days just keep the “essential” books . . . more like the reference ones with gardening, etc. I think I would make a patchwork blanket! I’d love the book to get some inspiration! I want to make a patchwork wool blanket as well. It sounds so cozy! Good luck towards winning! I’ve never even considered making or wearing a cape, but seeing you in your cape and hearing that you love it so much–now I want one too!! Yay Amy! 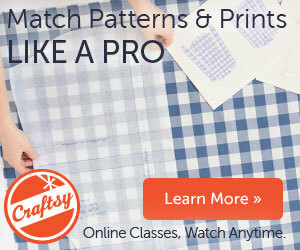 You’re a great teacher (Craftsy classes) an an inspiration! You should want one- they are amazing! It is honestly one of my favorite things I own. Love the cape but really could enjoy knee high booties for adult diabetics! My feet and legs would love the warmth that pendelton provides. Knee high booties- what an intriguing idea! They certainly sound really warm and comfortable! I could definitely us a good cape in my life 🙂 Wool is awesome though, so I certainly wouldn’t limit it to just that, lol. Thanks so much for the giveaway! CAPES FOR EVERYOOOONE (said in my best Oprah voice)! 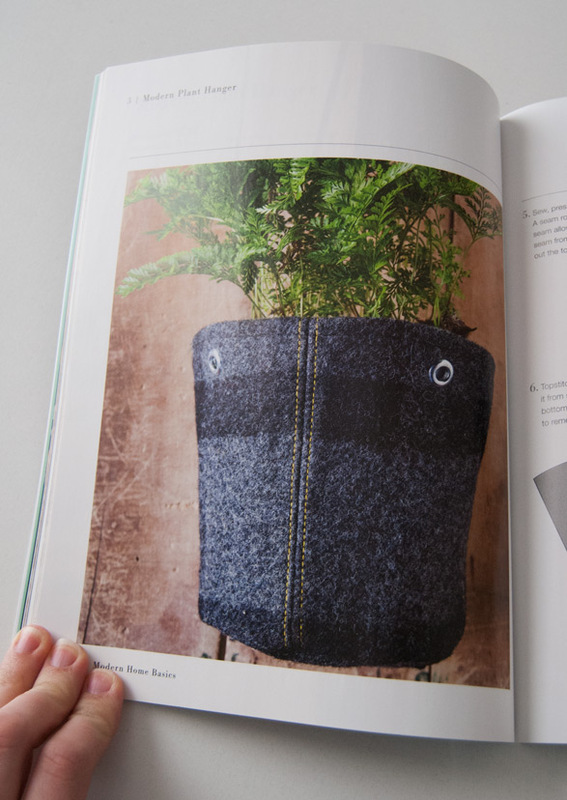 Yes, wool is awesome- good luck winning the book! Gotta make a capr !! But of course! There is nothing better than an amazing wool cape. I’d love to make a cape for the chilly mornings! I’m happy to hear it! I think everyone needs a cape. There are some great ones in this book. I really love the ottoman and the clutch in it, along with, OF COURSE, the cape. I just google the Lindsey Thornburg cloaks and my jaw dropped. They are AMAZING! Yes, I for sure have to have all my ducks in a row and lined up for the next Woolen Mill sale. I always think of a project after the sale is over! I love the cape I have too. It’s still going strong after 20 years. The stitching on your plant hangers is lovely – I’d like to tweak the project a bit to make vase covers. What a good idea, the vase covers. Yes, the pattern could certainly easily be tweaked. 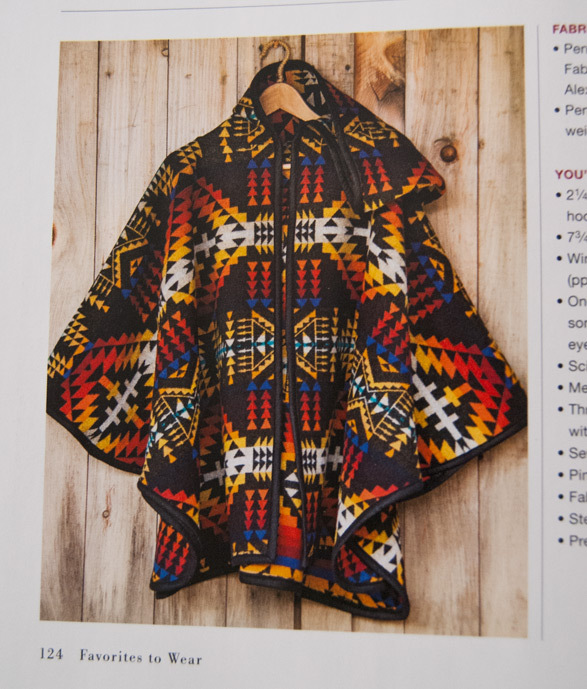 Is your cape a Pendleton or wool one? Years ago, ( I won’t say just how many!) I entered a ‘Make it With Wool’ contest here in Iowa, and that was the beginning of my enjoyment for working with wool. And Pendelton is tops. I look forward to the projects in the new book. Thank you for sharing. You’re welcome! Yes, wool is so lovely to work with, especially nice Pendleton wool. There’s nothing I like more than giving wool a good press and having it iron out exactly the way I want it to! And the footstool would be perfect in our home! This is the perfect project for the beautiful wool fabric I received through a posting on freecycle.org. A lovely royal blue and black geometric pattern with a Native American feel about it. Ooo, it sounds lovely! Good luck toward winning the book! I’m a a knitter so I looooove wool!!! I just started sewing a few months ago, but I really want to make a wool skirt. They look so nice and warm (and professional) I’m not yet so comfortable sewing that I would risk sewing with very nice and expensive wool, but it is definitely on my ‘I need to sew this’ list. Thanks for this giveaway!